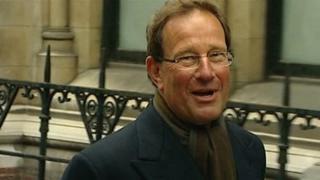 Richard Desmond, whose publishing company owns the Daily and Sunday Express, has donated £1m to UKIP. Mr Desmond said UKIP was "not run by elitists" and was a party for "good, ordinary British people". UKIP leader Nigel Farage said the money would help "significantly" in its fight "against the big battalions". Mr Desmond, owner of Northern and Shell Media Group, donated £300,000 to the party late last year. As well as the Daily and Sunday Express, the group publishes OK! and Now! magazines, as well as the Daily Star and Daily Star Sunday. Mr Desmond said UKIP, which campaigns for the UK's exit from the European Union, did not have "a massive party machine or highly paid public relations people" and was "struggling to have a voice". Explaining his donation on the Express website, Mr Desmond said: "They are human; they are not perfect and they do not pretend to be. But what they believe in is the best for the British people. "They are the sort of people who will stand up for people who are struggling." Mr Desmond donated £100,000 to the Labour Party in 2001, around the time of Northern and Shell's takeover of the Express. The Daily Express has long supported Nigel Farage and his party in its coverage. Its half a million or so readers will be well acquainted with anti EU politics. The paper's owner has given money before as well. But this is Richard Desmond's biggest donation to date and it comes at a crucial time when the coffers are running low. UKIP raised a record amount in the run up to the election, helped hugely by a million pound gift from the insurance businessman and former Tory supporter Arron Banks. Mr Desmond said UKIP was a party for "good ordinary British people". Nigel Farage has told the BBC he thinks the media owner has done a brave thing and hopes others will follow suit. However, while the Daily Express has previously backed the Conservatives, in recent months it has repeatedly praised UKIP in editorials. Wednesday's Express comment described UKIP as a party "that speaks for a large number of ordinary Britons", with a manifesto offering "an attractive package of measures". Party leader Mr Farage told the newspaper: "This money will make a big difference. We are up against the big battalions; this helps significantly. "It enables us, particularly with our online presence, to reach bigger and bigger audiences. "We've been doing very well compared to the big parties already and this will make a big difference." Asked how he was going to spend the £1m, as he arrived for the BBC's live election debate on Thursday evening, Mr Farage said: "Well it's not mine but it's going to be spent on advertising for the campaign." Despite a slight dip in some recent polls, UKIP has been polling ahead of the Liberal Democrats and is hoping to add to the two MPs it gained in by-elections following defections from the Conservatives.